2 + items $13.99 ea. Juzo Silver Sole socks were designed for men and women with sensitive feet. Juzo Silver Style #5760AB is low cut -- shorter than crew or knee lengths, higher than the anklet. The mild 12-16 mmHg compression increases circulation to the foot and ankle. Juzo Silver Sole socks have a pillowed sole which adds cushion to reduce blistering and callous buildup. The channeled toe seam helps reduce toe irritation. Juzo Silver Sole socks are recommended for athletes, diabetics, and people who work hard on their feet. Made with X-Static® - The Silver Fiber®. Latex Free. White Only. :: Packaging: One pair in cardboard sleeve. Juzo® Silver Sole™ is made with X-STATIC® silver fibers which allow Silver Sole™ to naturally utilize antimicrobial benefits. Plus with our special pillowed sole protection you can walk for miles and your feet will feel great. 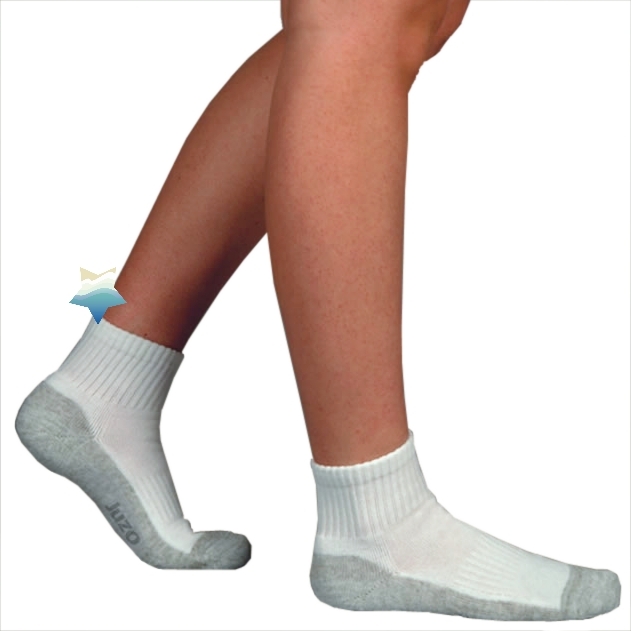 Provides mild compression to increase circulation in the foot and ankle. Added cushion to reduce blistering and callous buildup. Sole Knitted with X-Statis silver fibers for odor reduction & antibacterial protection. Compressive mid-foot to prevent bunching of the sock. Seam is inset to minimize the potential for irritation. Juzo Silver is permanently bonded to the textile fibers. Laboratory tests show that Juzo Silver compression stockings maintain high efficacy even after 100 washes. Machine wash, warm water. Low dry or dry flat. To maintain the life of your silver socks, we recommend using Juzo detergent. Since Juzo recommends washing their easy-to-care-for compression garments everyday, using Juzo's natural laundry detergent to gently care for your hose and skin. Because compression therapy garments are designed and manufactured differently, there are a few key features to look for to ensure a positive, comfortable wearing experience. Latex-Free - All Juzo garments are Latex-Free! Garments manufactured with latex rubber have a shelf life. Over time, the latex rubber compression fibers will begin to breakdown and crumble from exposure to sunlight, heat, oils, lotions, ointments, or simply through wear. Some people run the risk of acquiring latex skin allergies while wearing garments made with latex. Material - All Juzo garments are made with Lycra! Lycra� is the highest quality synthetic compression fiber on the market. Lycra resists wear-and-tear. Some companies use Spandex -- a lower grade fiber, or latex rubber compression fibers which wear, are more susceptible to breakdown, are harder to care for and typically less comfortable to wear. Does your compression garment have a shine to it or feel sticky when you run your fingers over it on the inside? This indicates uncovered compression fibers! Stockings made with covered compression fibers are very important because they add wearing comfort, ensure greater durability, softness and ease of putting on and taking off. Juzo�s exclusive FiberSoft� process wraps each compression fiber with soft, protective threads which lift the compression fiber off the skin and increases the garments durability and comfort. Ease of Care - Juzo garments can be machine washed and dried. Compression therapy garments should be washed and dried each night. Latex rubber compression garments must be hand-washed and air-dried, while latex-free garments can be machine-washed and dried on low heat settings. Juzo offers a wide range of standard sizes to accommodate your needs. Plus, we also make custom-made garments tailored to fit virtually any size and shape. Juzo Compression Therapy Garments � the freedom to make the most of every day! Whether it�s being engaged in daily activities or spending time doing the things you really love, like traveling, being outdoors or participating in your favorite hobbies, you can continue to engage in daily activities while receiving the therapeutic benefits of compression. Compression stockings are designed to provide support to the legs and veins, assist with circulation, and minimize swelling. The compression is graduated, with the strongest support starting at the ankles and gradually decreasing towards the top of the garment. This gradual support works in conjunction with the pumping action of the calf muscles, which also assist with circulation. A common myth is that compression stockings will cut off circulation. When fitted and worn properly, compression stockings help with your circulation, not reduce or restrict it. Compression garments are categorized by classes. These classes consist of compression ranges, which are measured in mmHg---meaning millimeters of mercury, the universal form of measurement used for this type of garment. There are designated medical indications for each compression class. Will I Feel Comfortable Wearing Compression Therapy Garments In Public? Today�s compression stockings are very fashionable � most of them look just like regular hosiery or dress socks. No one will know the difference! We offer garments in various styles and colors. Are Compression Therapy Garments Comfortable? Compression stockings compliment your legs naturally and beautifully. In fact, our Exclusive FiberSoft™ technology adds softness and comfort, leaving your legs feeling energized all day long! How Should I Wear My Compression Stockings? In general, graduated compression stockings should only be worn during the day while you are upright and mobile, and should be taken off and washed at night. Consult your primary care provider for specific instructions. If you need to wear your garment every day, you may want to consider purchasing a second pair so you will always have one pair to wear while the other is being washed.